A baluster is an upright wood support for a banister. It is also commonly known as a stair stick or stair spindle. The bottom of a baluster is secured to a stair tread by being seated in a notched hole and glued, nailed, screwed or doweled in place. The top of a wood baluster is secured to the underside of the banister with screws, nails, glue, dowels or it is fit inside of a notched hole. 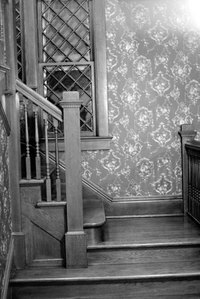 Over the course of time and normal use, wood balusters can loosen, leaving a wobbly stair rail. Tightening a wood baluster is a fairly easy do-it-yourself project and can be completed quickly. Apply wood glue in a liberal amount to a thin wood shim (which is a thin piece of wood used to fill gaps), at the point where the baluster fits into the underside of the banister and/or where the baluster meets the stair tread. Forcefully shove the wood shim into the gap. Allow the wood glue to dry and set, then grasp the end of the wood shim, either with pliers or your fingers, snap off the unglued end of it and sand down any rough edges. This method works well for balusters that fit into notched holes. Fit an "L" bracket to the underside of the banister, use a power screw driver and screws to secure the bracket in place. Screw the other segment of the "L" bracket to the wood baluster. These brackets are available at home-improvement stores and hardware stores. This technique works best on the underside of the handrail because it will not be as noticeable as a bracket on the bottom of the baluster. Use a power drill to pre-drill a hole at a 45° angle up toward the banister and/or down toward the stair tread. Use a power screw driver to drive a screw through the pre-drilled hole into the underside of the banister or surface of the stair tread. Holes are pre-drilled to avoid wood splitting and causing further damage. Use wood putty to cover the screw head. Do not use this method on the bottom of a baluster if stairs are carpeted because the screw will not tighten the baluster enough to secure it. Routinely check wood balusters for strength and fix accordingly.